Earlier today, he inaugurated the 106th edition of the Indian Science Congress at Lovely Professional University (LPU) in Jalandhar. Modi in Gurdaspur LIVE: The Centre is trying every bit but the state government needs to wake up on some of the schemes. I request the Punjab government to social welfare projects within stipulated time. Modi in Gurdaspur LIVE: 2.5 lakh youths have been trained under the Skill India Mission. With the ‘Beti Bachao Beti Padhao’ programme, population of daughters has increased in several Punjab districts. 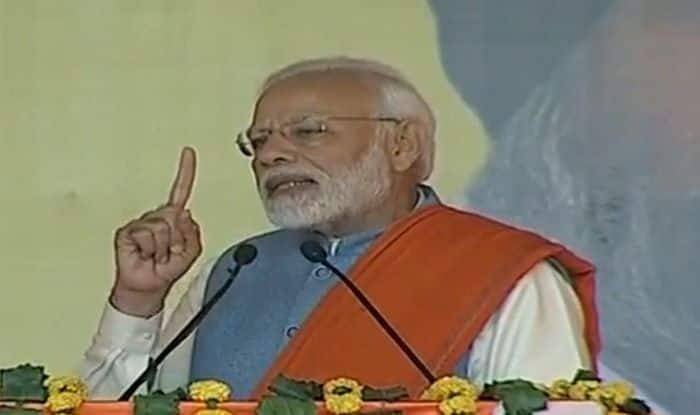 Modi in Gurdaspur LIVE: PM takes dig at Punjab’s Congress govt over Navjot Sidhu’s Pak visit for Kartarpur corridor event. Modi in Gurdaspur LIVE: In a veiled attack on Kamal Nath, PM says Congress has made people accused in riots cases CM . Modi in Gurdaspur LIVE: People of Punjab need to beware of who have a history of killing thousands of Sikhs, those who are awarding CM post to riot accused. Prime Minister Narendra Modi is addressing a rally in Punjab’s Gurdaspur. Earlier today, he inaugurated the 106th edition of the Indian Science Congress at Lovely Professional University (LPU) in Jalandhar. He added added Jai Anusandhan to former prime minister Lal Bahadur Shastri’s famous slogan of Jai Jawan, Jai Kisan and Atal Bihari Vajpayee’s Jai Vigyan. The rally in Gurdaspur is part of the BJP’s campaign to hold PM’s 100 rallies across the country ahead of the Lok Sabha elections.